5. 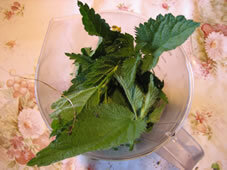 Put the nettle leaves and the potatoes in a saucepan with water and cook on low heat for 20 mins. Add a little stock and salt. 6. If necessary, put the mixture in the blender or serve directly. 7. Add a little butter, cream and/or pepper. – Eat once a day.